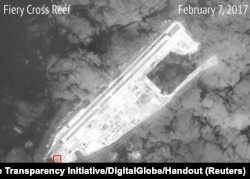 A satellite image shows what CSIS Asia Maritime Transparency Initiative says appears to be concrete structures with retractable roofs on the artificial island Fiery Cross reefs, South China Sea, in this image released on February 22, 2017. An image of North Island in the Paracels group taken on March 6 shows recent work including land clearing and possible preparation for a harbour to support what experts believe may be eventual military installations. Initial work was damaged in a typhoon last year. The more widely disputed Spratlys archipelago to the south are higher profile but the Paracels are key to China's presence in the South China Sea. "There's also uncertainty with this young Trump administration, but this is very important work to the Chinese - the Paracels are vital to defending Hainan, which is in turn important to China's nuclear deterrent," he said. "The calculation here is that it is really only Vietnam that will be rattled by this." China's Defense Ministry said it was "not familiar" with any work at North Island. "What needs to be stressed is that the Xisha Islands are China's inherent territory," it said, using the Chinese name for the Paracels. China fully occupied the Paracels in 1974 after forcing the navy of the-then South Vietnam off its holdings. Diplomatic sources in Beijing say China is not looking for confrontation with the United States over the South China Sea, pointing to China's low-key reaction to last month's patrol of a U.S. aircraft carrier strike group in the waters there. Last week, Chinese Foreign Minister Wang Yi said a draft code of conduct for behaviour in the South China Sea had now been completed and that tensions had "distinctly dropped."